Learn the Coaching Super Powers, Masteries and Skills! Delve into and practice the 10 Coaching Super Powers and 10 Coaching Skills; also known as the ICF Core Competencies. Playing with these Super Powers will accelerate you into Coach Approach Leadership and enjoying life in the Connected Age of Purpose. 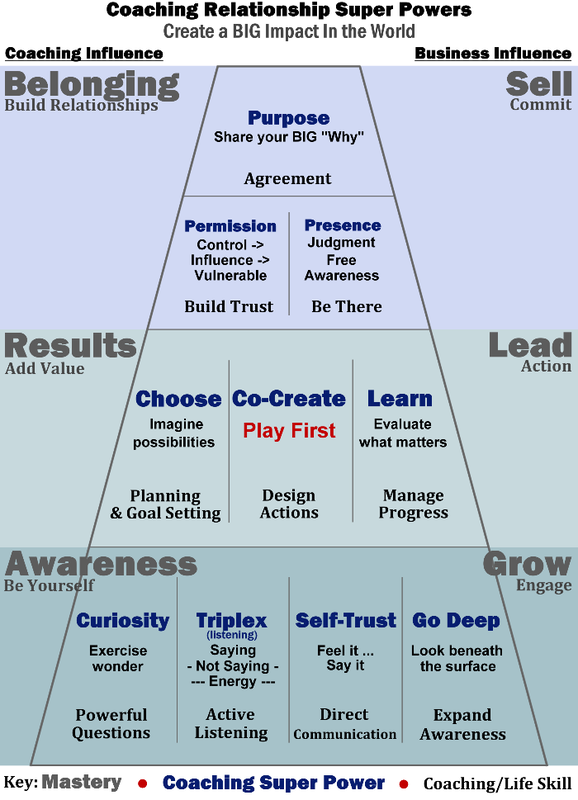 From: Coaching is telling people how to do things the right way. If you aim to become a Certified Coach, your ability to demonstrate the 10 Super Powers at a professional level is the basis of our evaluation process for ICF certification. Here is the model for this program! 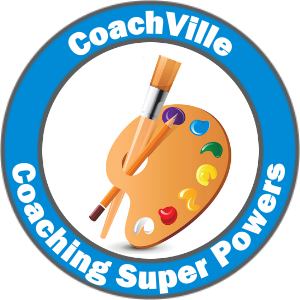 We will cover each of the 10 Coaching Superpowers and 10 Coaching Skills (aka Core Competencies) one at a time, in a way that makes them easy to use and remember; and we will demonstrate how each Super Power / Skill naturally leads to the next. To be a master crafts person you must know and practice the basic skills – over and over again. Using our active learning method, you will learn each skill through observation and practice. This is important because your ability to demonstrate these Super Powers is what will ultimately lead to your certification. When you look at the ten core skills, they look pretty… well… basic! They are. The key is to MASTER them through the 10 Super Powers and continual practice of talking like a coach. The Spirit of Play and Play Pattern language set the Coach Approach apart from every other approach to Human Achievement. When you keep your conversations around playing big and playing better you will never be confused with another type of professional. If your aim is to become a practicing Professional Coach then it is essential for you, your players and our profession that you learn how to demonstrate these skills. We will explore how to distinguish coach talk from patterns that you may already be familiar to you. 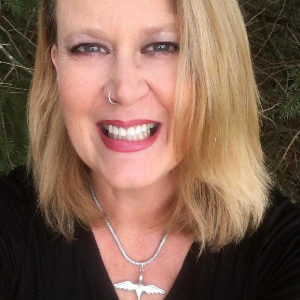 When you are new to coaching, it is VERY easy to fall into conversational patterns that you are familiar with like friend, boss, colleague, parent (or counselor, therapist if you have done these). The key distinction is how you balance support and challenge. To become great you must be challenged out of your comfort zone and then fully supported as you face these challenges. You will learn how to do this using the basic coaching Super Powers. Coaching is way more challenging than it first appears and mistakes WILL happen. Just like your players make mistakes in the game they are playing. Mistakes are a part of any worthwhile venture. The key is to be AWARE of the common mistakes so that you can avoid them and / or recover quickly when you make them. 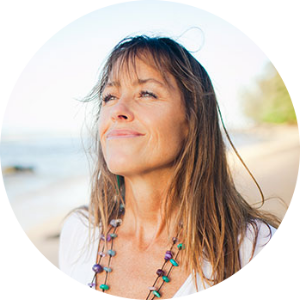 As part of the Basic Coaching class you will “listen in” on 6 provocative coaching conversations between Coach Dave and Player Maile of Maile Stones. As you listen in on these sessions you will learn how to use the Coaching Super Powers AND you will be inspired to bring the Coach Approach to your big game in life. 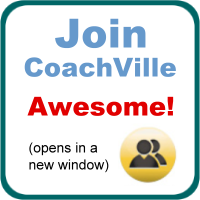 With this link you will first enter the CV Free Member Registration Page (takes 1 minute), then you will get instant access to all of these awesome resources from the Basic Coaching Class so you can check it out! I love the concept that coaching is about managing the energy. The idea of staying play- centered certainly lightens the energy. Focusing on “becoming”, as a process, naturally pulls our energies forward, rather than pushing. I’ve been playing all week with this idea: that as we focus more on becoming/mastery (future oriented), this is what can help fuel us. In turn, allowing us to be more fully engaged in the moment (present oriented), which is where all the magic happens.